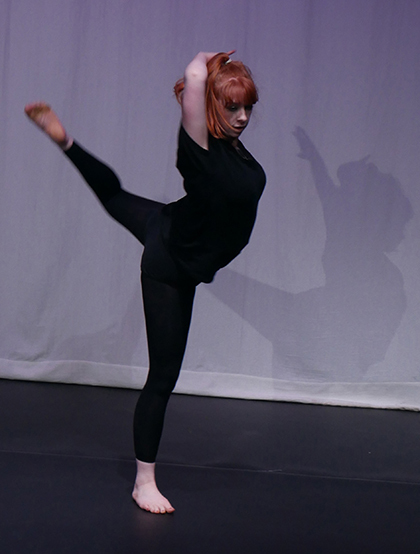 Dance students at The Sixth Form College, Solihull staged a Dance Showcase this week to show off their assessed A level choreography and performance pieces. The first and second year students put on a show of 13 group dances, all in a contemporary style. Their work was inspired by a choice of stimuli set by the exam board. The stimuli this year were wide and diverse, including a mixed media piece ‘Waiting’ by conceptual artist Kathy Prendergast, an instrumental piece of electronic/Hip-Hop music composed by Sweatson Klank as well as the concepts of ‘space exploration’ and ‘a lost city’. First year students also showcased a large ensemble performance which encompassed the contemporary techniques they have been learning this year in class to build their physical and technical skills; ‘fall and recovery’, ‘contract and release’ and ‘flying low’. The practical assessment, which incorporates both performance and choreography forms 50% of the marks in the A level Dance course. The rest is assessed by written exams, which focus on the inter-relationship between the creation, presentation and appreciation of dance.